Below is a photo of the 2nd green. You can slightly make out the contours of the green, but in person they are far more intimidating. This hole instantly made my favorites list. 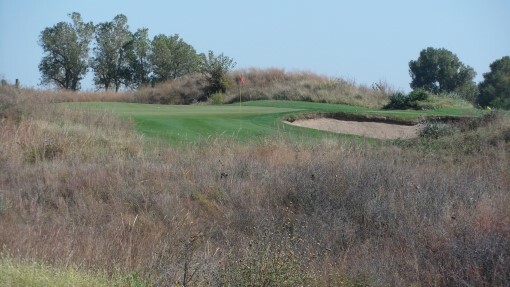 The photo below is of the 3rd hole which is a short par 4 that played 308 from the white tees. The green is visible in the distance and if a player wants to carry the gunsch he can hit driver right at the putting surface. 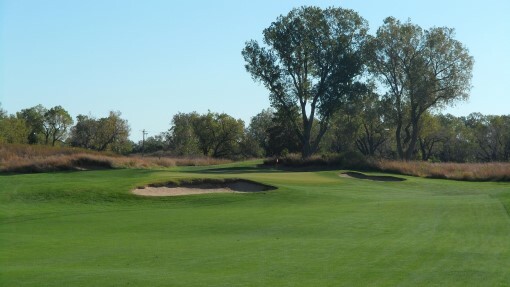 A more sensible play is certainly a 200 yard shot somewhere between the green and the right fairway bunkers. Another par 3 awaits at the 4th hole. This one plays 150 yards plus a little extra for the uphill. With today’s flag location it pays to hit the green. Missing left where the bailout area is leaves a short sided chip which can be tough to leave close to the hole and could end up back at your feet. The 5th hole is a healthy par 4 of 402 yards from the white tees. The tee box is elevated so its one of those spots where it feels like you ball flies forever when you hit a good drive. The fairway is plenty wide but as you can see there is gunsch all down both sides waiting for the wayward tee shots. I absolutely loved the 6th hole. 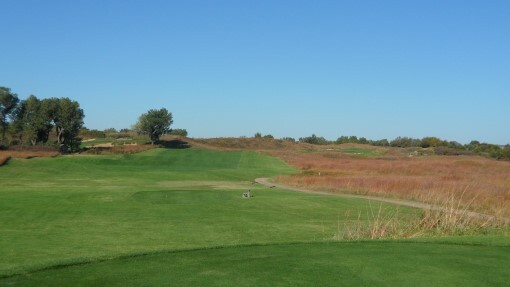 It is another elevated tee box and is a slight dogleg left that played 360 yards from the white tees. 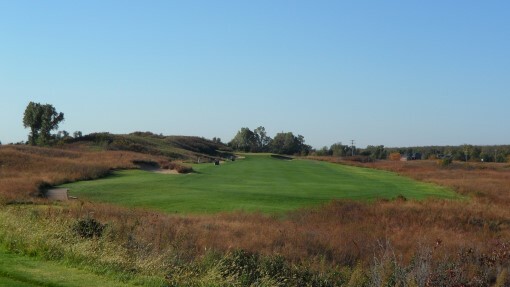 As is the tee box strategy on most holes at Prairie Dunes, just try to hit it in the middle and avoid the gunsch. 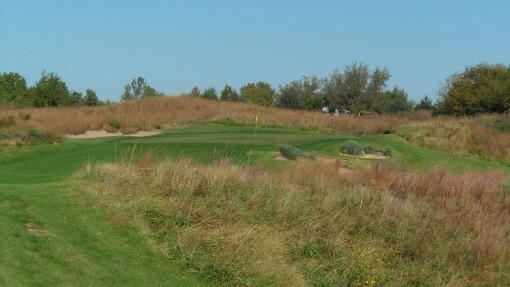 Below is a photo of the approach on the 6th hole. This fantastic green was protected by a pair of very nasty bunkers. 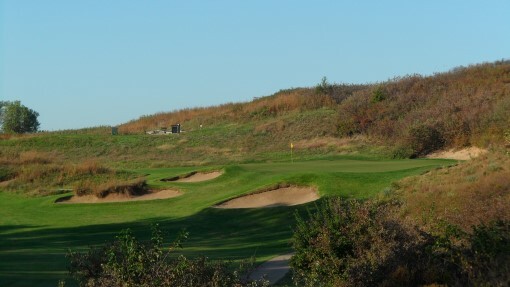 The 7th hole is the first par 5 of the course and the only one on the first nine holes. 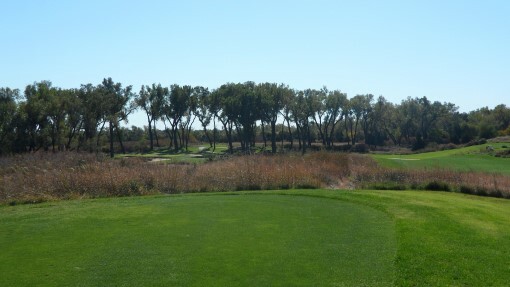 From the white tees it is eminently reachable playing only 487 yards. 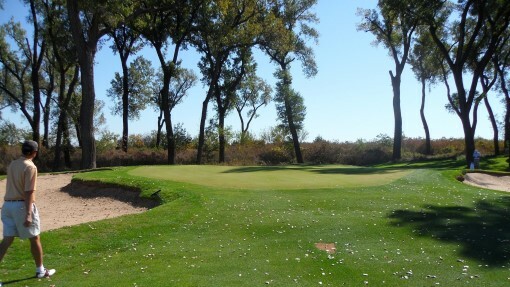 The photo below is of the 7th green. For those players going for this green in two may I suggest making sure you hit the green or miss short. The gunsch on the sides and behind this green is absolutely unforgiving. 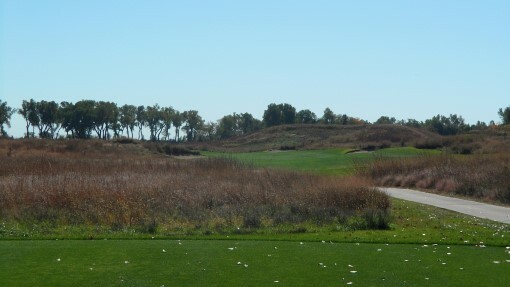 It’s no surprise that the most famous hole at Prairie Dunes is also the most difficult. Those two superlatives often keep company together and the 8th hole here is no exception. 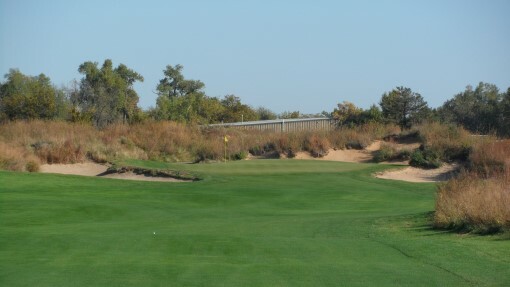 Playing 417 yards from the white tees (468 from the tips) and to a par of 4 this hole is uphill all the way and enough to bring a good player to his knees. The hole doglegs to the right so the drive must hug the right side of the fairway in order to have the shortest shot into the green possible. 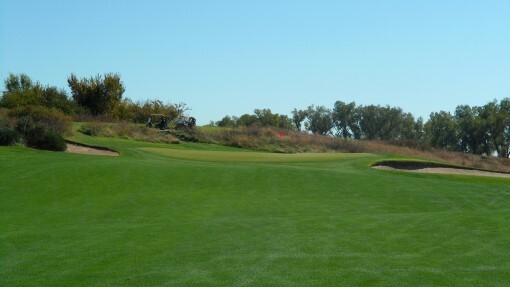 Drives that go left can have well over 200 yards into the green, even from the white tees. 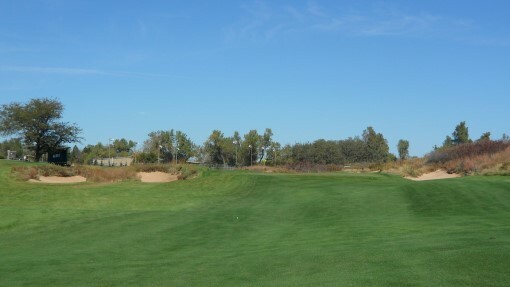 The photo below was taken from the tee box. Below is a photo taken from where the ideal approach shot would be played from. This is a good 160-170 yards to the green from here. Note the topography of this hole and the course in general. This is not your typical Kansas flatland. Here is a little more zoomed in view of the 8th green. The 9th hole played a solid 400 yards from the white tees. The fairway is again very wide, but any swings that get too loose will result in a ball lost to the gunsch. Along the left side of this fairway is where the guest cottages will be next year once they are finished. Note that the fairway here is very undulating. 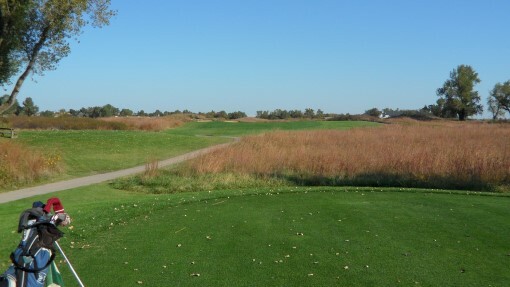 Many of the fairways at Prairie Dunes have a rumple effect going on which makes for a lot of interesting uneven lies. Below is a photo walking up to the 9th green. After finishing up the 9th hole we walked over to the other side of the clubhouse where the second nine holes reside. 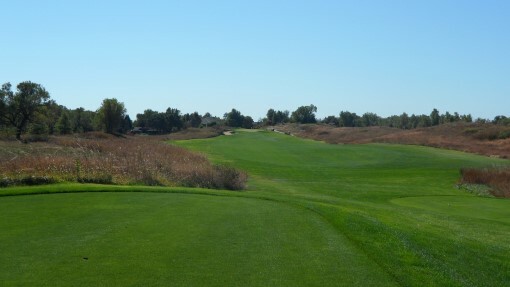 This side starts off with a nice little par 3 that played 160 yards from the white tees. Again this shot is uphill so a little extra club is necessary. 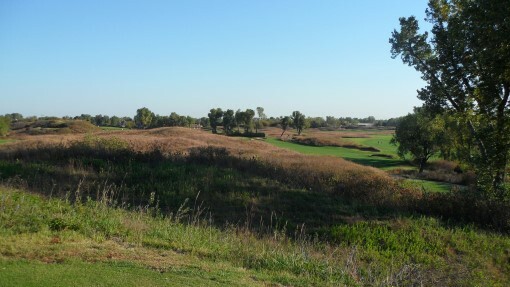 The photo below was taken from the tee box. I got a little carried away with the zoom during this round so this picture is essentially just the green. The 11th hole is a serious par 4 of 442 yards from the white tees. 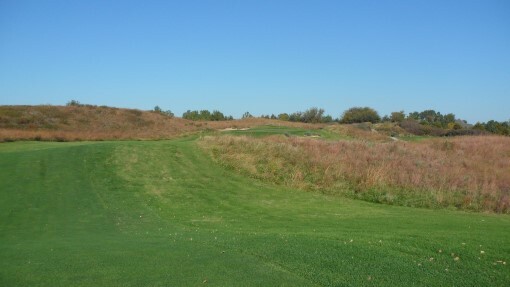 The photo below was taken from the tee box and the hole doglegs to the left. If you can hit a high draw this would be the spot for it. Note the body of water on the left side of the photo. This is the only water on the course and its not really in play at all. 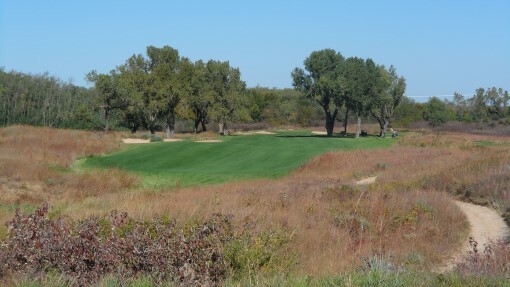 Below is the green complex for the 11th hole. Note the undulations of the fairway leading up to the green. Makes for some interesting bump and run shots. 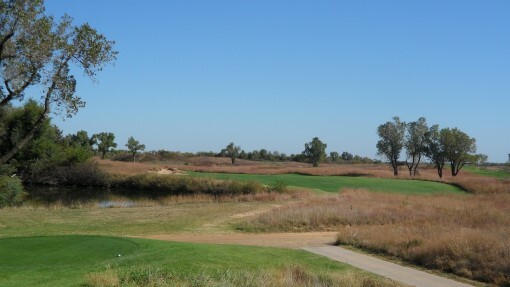 The photo below is of the 12th hole which is a par 4 that we played at 371 yards from the white tees. The tee box is elevated so a little extra yardage can be picked up on the drive. Drives going too far to the right run the very likely risk of resulting in an approach shot that is blocked out by the trees. In the morning game I had to hit a low running shot into the green for this exact reason. This is a closer shot of the 12th green. Even from this spot in the fairway you can see that the tree is a potential hazard. 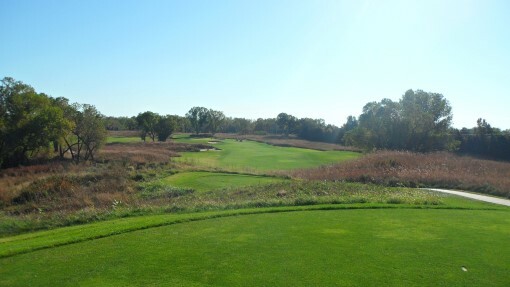 The 13th hole is a par 4 that plays 357 yards from the white tees. The tee shot is blind as the ideal line is just over the bunker on the left side of the fairway. A driver can cause some trouble here so really a 3 wood or long hybrid will do the trick just right. 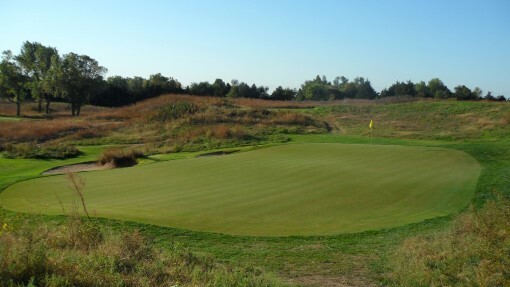 The photo below is of the 13th green complex. Yet another green that accepts a running shot. This course is definitely designed to allow the ground game. Very few of the greens require a shot in the air to reach them which no doubt comes in handy when the wind blows as it often does. The 14th hole is another semi-blind tee shot. 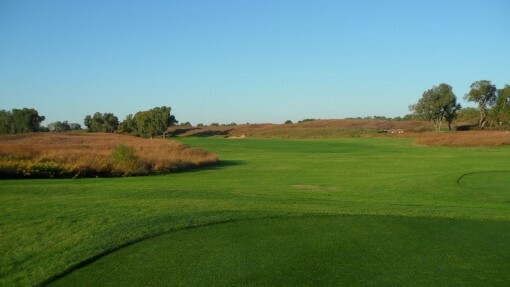 This one is shortish par 4 that plays 342 yards from the white tees. There are options from the tee of playing the ball as far left or right as you like. The further left you go the shorter your approach shot will be but also the more gunsch that has to be carried. Its easy to make bad decisions on the tee box at this course, so unless you are very consistent off the tee my advice would usually be to take the safe route. 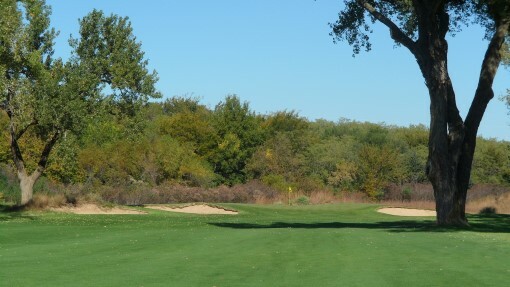 Below is the 14th green which sits back in a little hollow of trees. For a minute you might get confused and think you are playing a parkland course on the east coast. 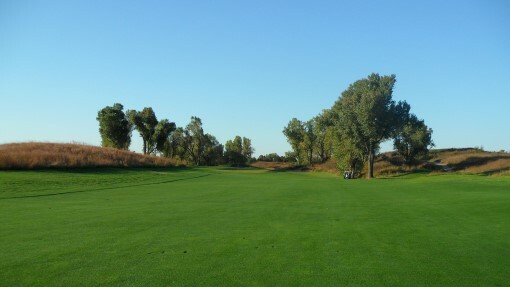 The 15th hole is a mid-length par 3 that we played at 170 yards from the white tees. Again I got carried away with the zoom lens and didn’t really get the “whole picture”. If I had, you would see that there are trees around the tee box that create a chute that must be negotiated with the tee shot. The 16th hole starts a fantastic stretch of finishing holes. This one is a par 4 that played 396 yards from the white tees. A good drive here is necessary to try and get as close as possible for the approach shot. The hole plays uphill so it takes a bit of extra club to get the ball to the green. 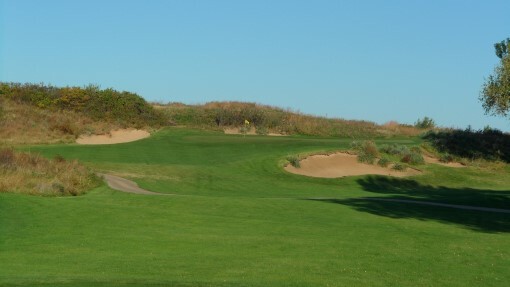 The 17th hole is the second and last par 5 on the course. This one plays 477 yards from the white tees so it is quite reachable as well. The drive is hit downhill and the the approach shot is back uphill to a green that sits on a plateau. Below is a look at the approach to the 17th green from a layup position. 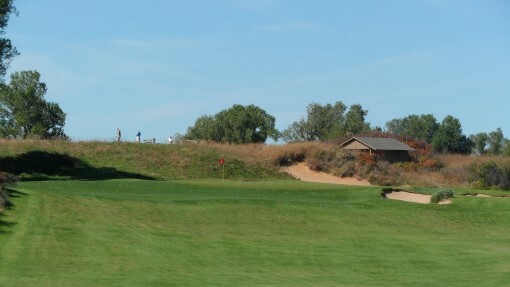 The 18th hole played as a 372 yard par 4 from the white tees and gives the player one last chance to hit a nice drive from an elevated tee box. 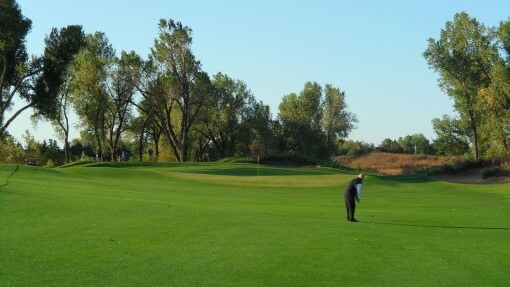 The fairway falls off to the left so its best to favor the right side of the fairway. 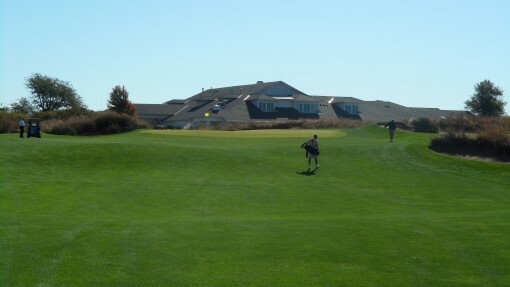 The photo below is of the approach shot into the green. After we finished the morning game we went into the clubhouse for a little lunch and then got right back out there an played an afternoon game from the blue tees which stretched us back to 6,515 yards. My scores were essentially the same from both sets of tees . . . very bad. With the gunsch out there unmercifully punishing players who make mental and/or swing errors there are big numbers literally just lurking everywhere. Making your third stroke off the tee is no way to post a respectable score. As the sun was setting on our 36th hole of the day and I teed up my final drive I was literally down to my last ball . . . and had been for three holes!! If you haven’t picked up on my drift yet, the course is tough and good decision making on the tee is crucial. 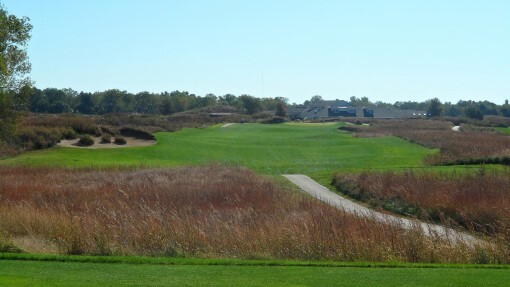 Despite my lackluster play I had a blast at Prairie Dunes Country Club. The course is really a thing of beauty and quite the collection of fantastic golf holes. 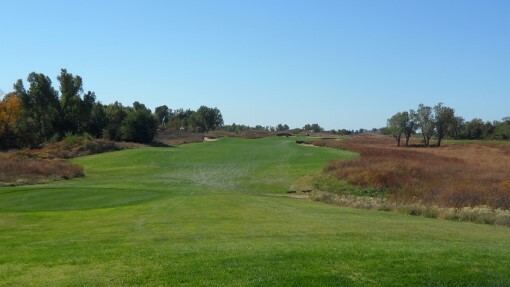 The course is full of really fun shots and also offers a great challenge for the low handicap players. It is no wonder that golfers from all over the country jump at the opportunity to be a member at a course like this and visit often. 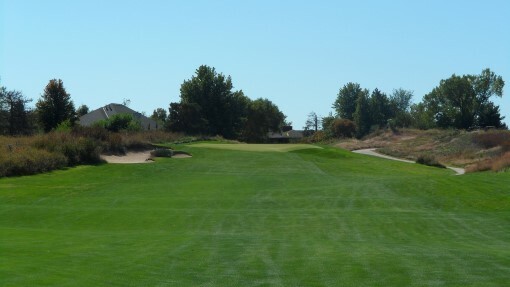 In my opinion, Prairie Dunes is well worthy of the high accolades it receives. 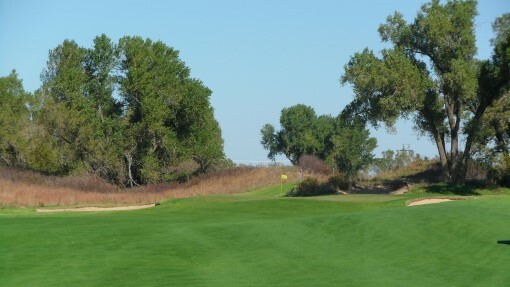 This entry was posted in The Itinerant Golfer and tagged courses, Golf Courses by . Bookmark the permalink.